This map shows the following hunts: The Oakley Hunt and parts of the Cambridgeshire. Scale approx 1 inch = 2 miles. This is a limited edition of only 100 copies per county. They measure 12x16ins as the actual map size and 16x24ins as the paper size they are printed on. 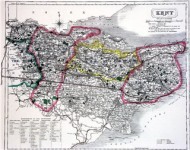 This map shows the following hunts: The Old Berkshire, The Craven, The South Berkshire and Mr.Garths. Scale approx 1 inch = 3 miles. 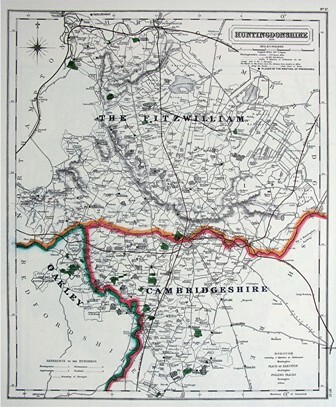 This map shows the following hunts: The Vale of Alylesbury, The Old Berkley, Baron RothchildÕs, Mr.Lowndes and parts of The Grafton, Oakley, Bicester, South Oxfordshire and His Majestys Stag Hounds.. This map shows the following hunts: The Oakley Hunt and parts of the Cambridgeshire. Scale approx 1 inch = 2 miles. 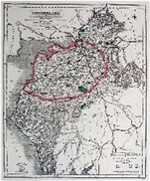 This map shows the following hunts: the Cheshire hunt and, parts of the North Staffordshire and the Sir W.W.Wynne. 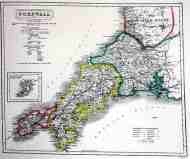 This map shows the following hunts: The Western, The Four Burrow, Mr LeamonÕs (North Cornwall & East Cornwall. Scale approx 1 inch to 6 miles. 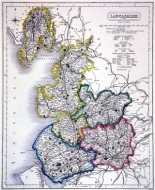 This map shows the following hunts: The Cumberland Hunt. Scale approx 1 inch = 5 miles. This map shows the following hunts: The Meynell hunt and part of the Grove & Rufford hunt. Scale approx 1 inch to 4 miles. This map shows the following hunts: The Durham, and the north part of The Hurworth and York & Ainsty. Scale approx 1 inch to 3 miles. 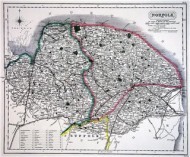 This map shows the following hunts: The Essex, The East Essex, Mr. Scratton (The Essex Farmers & Union, The Essex & Suffolk hunts, and part of The Puckeridge. Scale approx 1 inch to 4 miles. 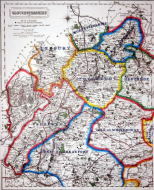 This map shows the following hunts: The Duke of Beaufort, Berkeley, Cotswold, VWH, North Cotswold and parts of the Heythrop and Ledbury. Scale approx 1 inch to 4 miles. This map shows the following hunts: Hampshire (H.H. 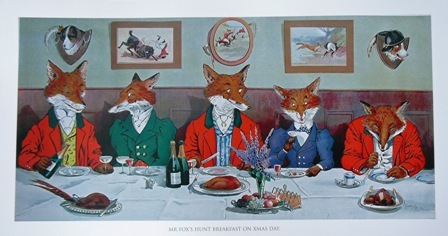 ), The Hursley, The Hambledon, The New Forest and The Isle of Wight hunts. 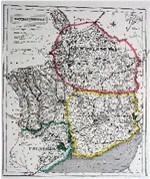 Also, parts of The Craven,The Tedworth and The Lord Leconsfield. Scale approx 1 inch to 4 miles. This is a limited edition of only 100 copies per county. They measure 12x16ins as the actual map size and 16x24ins as the paper size they are printed on. This map shows the following hunts: The North Herefordshire, The South Herefordshire, and parts of The Ludlow, Ledbury, West Herefordshire and Monmouthshire hunts. Scale approx 1 inch to 3 miles. This is a limited edition of only 100 copies per county. They measure 12x16ins as the actual map size and 16x24ins as the paper size they are printed on. 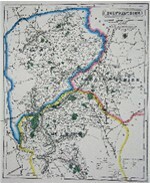 This map shows the following hunts: The Puckeridge and Mr. LeighÕs (The Enfield Chase. 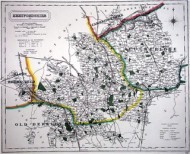 Also, shows parts of The Old Berkley and The Cambridge. Scale approx 1 inch to 6 miles. This is a limited edition of only 100 copies per county. They measure 12x16ins as the actual map size and 16x24ins as the paper size they are printed on. This map shows the following hunts: Fitzwilliam and parts of The Cambridgeshire hunts. Scale approx 1 inch to 2 miles. This is a limited edition of only 100 copies per county. They measure 12x16ins as the actual map size and 16x24ins as the paper size they are printed on. This map shows the following hunts: The The West Kent, The Tickham and The East Kent and part of The Surrey Union. Scale approx 1 inch to 4 miles. This is a limited edition of only 100 copies per county. They measure 12x16ins as the actual map size and 16x24ins as the paper size they are printed on. 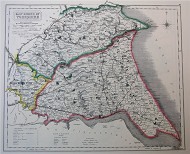 This map shows the hundreds of the county and does not actually show the foxhunting areas. 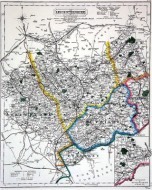 But is a lovely map from this seriesScale approx 1 inch to 6 miles. This is a limited edition of only 100 copies per county. They measure 12x16ins as the actual map size and 16x24ins as the paper size they are printed on. 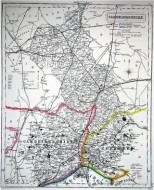 This map shows the following hunts: The Quorn, Mr.Tailby (The Fernie) and parts of The Atherstone, The Belvoir, The Pytchley and The Cottesmore. Scale approx 1 inch to 3 miles. This is a limited edition of only 100 copies per county. They measure 12x16ins as the actual map size and 16x24ins as the paper size they are printed on. 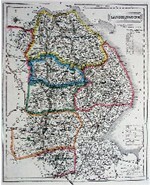 This map shows the following hunts: Lord YarboroughÕs (The Brocklesby), The Burton, The Blankney, The Southwold, The Belvoir and part of The Cottesmore hunts. Scale approx 1 inch to 4 miles. This is a limited edition of only 100 copies per county. They measure 12x16ins as the actual map size and 16x24ins as the paper size they are printed on. 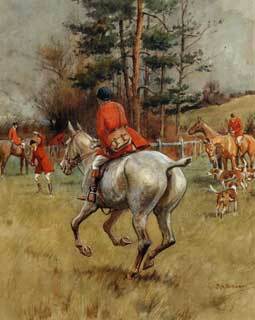 This map shows the following hunts: His MajestyÕs Staghounds. The remainder of the map is of London and is an amazing insight into how London has grown since 1870 (Holland Park is in the country). Scale approx 1 inch to 2 miles. This is a limited edition of only 100 copies per county. They measure 12x16ins as the actual map size and 16x24ins as the paper size they are printed on. This map shows the following hunts: The Monmouthshire and The Llangibby & Chepstow hunts, also, part of The Tredegar. Scale approx 1 inch to 2 miles. This is a limited edition of only 100 copies per county. They measure 12x16ins as the actual map size and 16x24ins as the paper size they are printed on. This map shows the following hunts: The West Norfolk and Lord Hastings. Scale approx 1 inch to 5 miles. This is a limited edition of only 100 copies per county. They measure 12x16ins as the actual map size and 16x24ins as the paper size they are printed on. 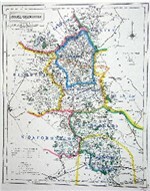 This map shows the following hunts: The Rufford, Mr.MustersÕ(now The Barlow), and parts of The Quorn and The Belvoir. Scale approx 1 inch to 3 miles. This is a limited edition of only 100 copies per county. They measure 12x16ins as the actual map size and 16x24ins as the paper size they are printed on. 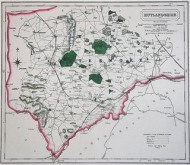 This map shows the following hunts: The Heythrop and South Oxfordshire (now part of The Heythrop), also parts of The Bicester, Old Berkshire & The Warwickshire. Scale approx 1 inch to 3 miles. This is a limited edition of only 100 copies per county. They measure 12x16ins as the actual map size and 16x24ins as the paper size they are printed on. This map shows the following hunt: The Cottesmore. Scale approx 1 inch to 3 miles. This is a limited edition of only 100 copies per county. They measure 12x16ins as the actual map size and 16x24ins as the paper size they are printed on. 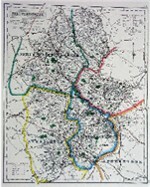 This map shows the following hunt: The North Shropshire, The South Shropshire, The Wheatland, The Ludlow and Th United. Also, parts of The Albrighton, The Watkin Williams Wynns. Scale approx 1 inch to 3 miles. This is a limited edition of only 100 copies per county. They measure 12x16ins as the actual map size and 16x24ins as the paper size they are printed on. This map shows the following hunt: The West Somerset and part of The Blackmore Vale and South & West Wilts. Scale approx 1 inch to 5 miles. This is a limited edition of only 100 copies per county. They measure 12x16ins as the actual map size and 16x24ins as the paper size they are printed on. This map shows the following hunts: The North Staffordshire, The South Staffordshire, THe Albrighton and parts of The Meynell and Atherstone. Scale approx 1 inch to 4 miles. This is a limited edition of only 100 copies per county. They measure 12x16ins as the actual map size and 16x24ins as the paper size they are printed on. 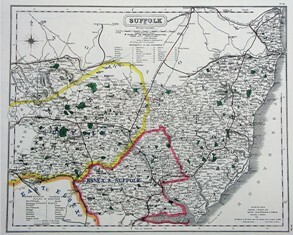 This map shows the following hunts: The Suffolk and The Essex & Suffolk. Scale approx 1 inch to 4 miles. 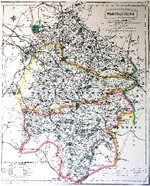 This map shows the following hunts: The Surrey Union, The Old Surrey & Burstow and The Hambledon. Scale approx 1 inch to 3 miles. This is a limited edition of only 100 copies per county. They measure 12x16ins as the actual map size and 16x24ins as the paper size they are printed on. 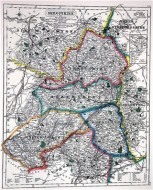 This map shows the following hunts: The Crawley & Horsham, The Southdown & Eridge (marked as Southdown + East Sussex), Chiddingfold, Leconsfield & Cowdray (marked as The Lord Leconsfield). Scale approx 1 inch to 5 miles. This is a limited edition of only 100 copies per county. They measure 12x16ins as the actual map size and 16x24ins as the paper size they are printed on. 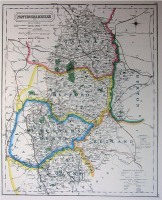 This map shows the following hunts: The North Warwickshire, The Warwickshire, The Atherstone and part of THe Pytchley. Scale approx 1 inch to 3 miles. This is a limited edition of only 100 copies per county. They measure 12x16ins as the actual map size and 16x24ins as the paper size they are printed on. 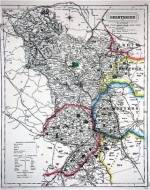 This map shows the Wards of the county and does not actually show the foxhunting areas. 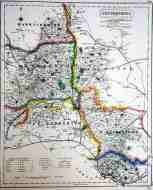 But is a lovely map from this series.Scale approx 1 inch to 3 miles. This is a limited edition of only 100 copies per county. They measure 12x16ins as the actual map size and 16x24ins as the paper size they are printed on. 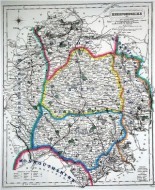 This map shows the following hunts: The Worcestershire, Albrighton Woodland,The Croome (marked as The Earl of Covenrty) and parts of The Ledbury and The Ludlow. Scale approx 1 inch to 3 miles. This is a limited edition of only 100 copies per county. They measure 12x16ins as the actual map size and 16x24ins as the paper size they are printed on. 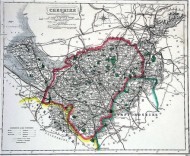 This map shows the following hunts: The Holderness and The Middleton. Scale approx 1 inch to 4 miles. This is a limited edition of only 100 copies per county. They measure 12x16ins as the actual map size and 16x24ins as the paper size they are printed on. This map shows the following hunts: The Bramham Moor, The Badsworth, Earl Firzwilliam, and parts of The York & Ainsty and Bedale. Scale approx 1 inch to 6 miles. This is a limited edition of only 100 copies per county. They measure 12x16ins as the actual map size and 16x24ins as the paper size they are printed on. 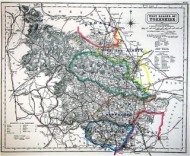 This map shows the following hunts: The Bedale, The Sinnington, The Hurworth, The Cleveland, Mr. Johnstone (now The Derwent, The Staintondale and The Goathland). Scale approx 1 inch to 6 miles. This is a limited edition of only 100 copies per county. They measure 12x16ins as the actual map size and 16x24ins as the paper size they are printed on.